In a previous post, I mentioned how paper should be prepared as a briquette ingredient. Two other ingredients I use on a regular basis are crushed dried leaves and sawdust. Sawdust need not be broken down further. Just ensure that wood shavings and chips that typically come from wood planing processes are removed. Dried leaves need to be really dry and brittle that they break up when crushing with your fingers. A really neat tool is a mortar and pestle setup like the one below that's big enough to crush and grind huge amount of dried leaves into smaller suitable pieces. Of course a hammer mill would be convenient, but we're just talking of simple and no-cost tools here. 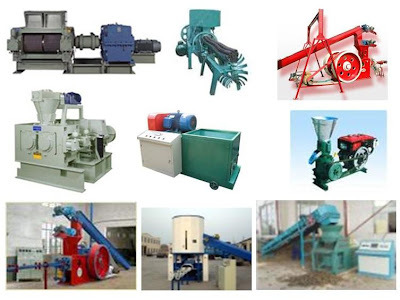 Apart from the "horse" briquette device, there are other manual briquetting machines out there. "Manual" here meaning hand-operated and without the aid of electricity or batteries. 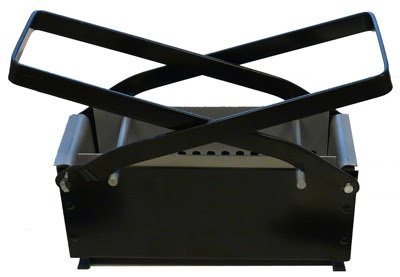 Here's a very popular manual briquette maker that has long been marketed on the internet. It uses discarded paper or old newspapers to create paper logs. Wet the paper, put inside and squish the water out. In a previous entry, I mentioned that paper has good binding properties that helps create a briquette that doesn't immediately fall apart. It's actually the fibers of the paper that has this. Cutting or shredding the paper (with a paper shredder) like in the picture breaks down the paper in size. The clean cuts do not however expose the paper's fibers. In a previous entry, I discussed the common materials used for briquettes and in another, a background on some commercial briquetting machines. The briquettes I create for our cooking are essentially made up of paper waste, sawdust and a little of other agricultural waste. The batches of briquettes I have made vary in color because of differing constituent mix. These briquettes are small and measure roughly 2 inches in diameter. From recent developments, I realized that this blog is best viewed using a browser OTHER than Internet Explorer Version 8. Version 8 is the latest version of IE (Internet Explorer) as of this writing. You will not receive any errors when using IE8 to view this blog but you will not see the blog displayed correctly. The blog's sidebars don't appear on the main page and the posts are incomplete when browsing with IE8. I've used Mozilla Firefox and have never had problems with it thus far. There are other browsers like Apple Safari and Google Chrome which I haven't tried. But for now, I would strongly suggest to avoid using Internet Explorer when viewing this blog. In a recent post about briquettes, the ones shown look really neat and most likely were produced from briquette machines like those pictured below. All of them, from the biggest machine that looks like a mini-power plant to the smallest machine that looks like a creature out of a "Transformer" movie will require some space and electricity. The large-scale production of briquettes for these machine will generally be for commercial purposes. The usual materials used for biomass briquetting are agricultural wastes. 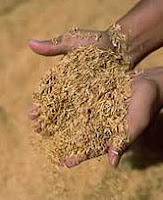 Examples of agricultural wastes include rice hull (shown on the left), corn husks, coconut shells, grass clippings, dried leaves, dried sticks and so on. 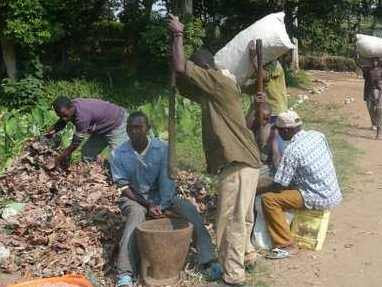 However, many non-traditional "wastes" have been incorporated into biomass briquette-making. Commercial wastes such as sawdust, paper and even charcoal powder have been used successfully in the production of biomass briquettes. In the briquetting process that I've devised, I've had varying results in the use of some of the above mentioned biomass materials. Since the process involves compaction, the materials would behave differently when compacted. "a briquette (or briquet) is a block of flammable matter which is used as fuel to start and maintain a fire. Common types of briquettes are charcoal briquettes and biomass briquettes." "Biomass briquettes are made from agricultural waste and are a replacement for fossil fuels such as oil or coal, and can be used to heat boilers in manufacturing plants, and also have applications in developing countries. Biomass briquettes are a renewable source of energy and avoid adding fossil carbon to the atmosphere." I've especially taken interest with biomass briquettes to fuel our cooking in our wood stove. 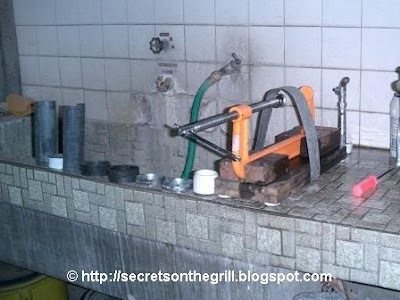 And I was able to devise a briquette-making machine that creates home-made briquettes. 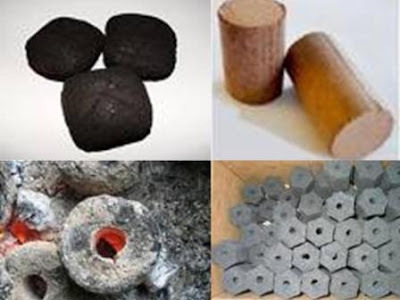 This briquette-making process will be the topic in forthcoming entries in this blog. Watch for them!